Preheat oven to 180°C/350°F. Remove outer leaves from Brussel sprouts, then halve. Slice kumquats and remove any large seeds. Wash the baby spinach leaves and let dry. Meanwhile, to make the dressing, halve avocado, and scoop out into a liquid measuring cup. Add crème fraiche, Worcester sauce, balsamic vinegar, honey, salt, pepper, olive oil, and a little water. Blend until smooth using an immersion blender. Transfer Brussel sprouts to a baking sheet, season with salt, add olive oil, toss well, and roast in preheated oven for approx. 20 min. at 180°C/350°F. Place sunflower seeds on another baking sheet and toast in the oven, in the rack beneath the Brussel sprouts for approx. 10 min. Add spinach to a large serving bowl along with the roasted Brussel sprouts. Add avocado dressing and toss well. 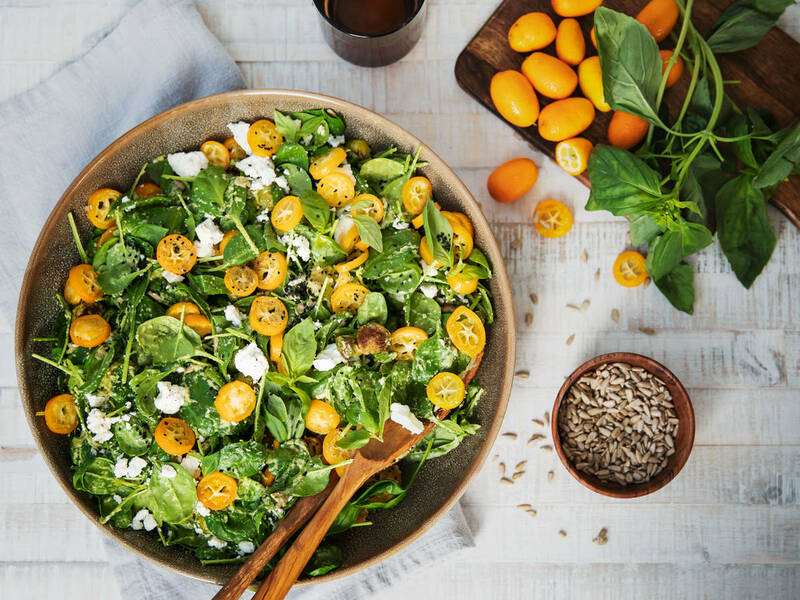 Top the salad with kumquats, crumble in the feta cheese, then add basil leaves, toasted sunflower seeds and nigella seeds. Toss again before serving. Enjoy!